Are you facing a legal issue or court case and need representation? You always receive personalized client care with our attorneys. With more than 50 years of combined experience, we have the skill and knowledge to provide the results you want and expect from the courtroom. Our attorneys work hard to exceed your highest expectations, whether you are dealing with issues of custody/divorce, the death of a family member, estate planning or are hoping to receive compensation for a personal injury. Schedule your complimentary, 30-minute consultation today by contacting our attorneys who are available in Columbia or Centralia, Missouri. 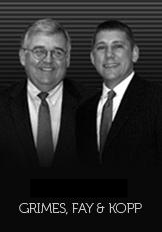 An experienced attorney is ready to meet any and all of your legal needs.